'Fragementos de 12 Partes' is the centrepiece of Alessia Innocenti's latest exhibition. Comprised of 12 panels and measuring over 2.8mts x 2.1mts this enormous piece radiates light. It deserves to be seen in real life as it illuminates the room whilst drawing the viewer into its light. 'Tricristalinos'. 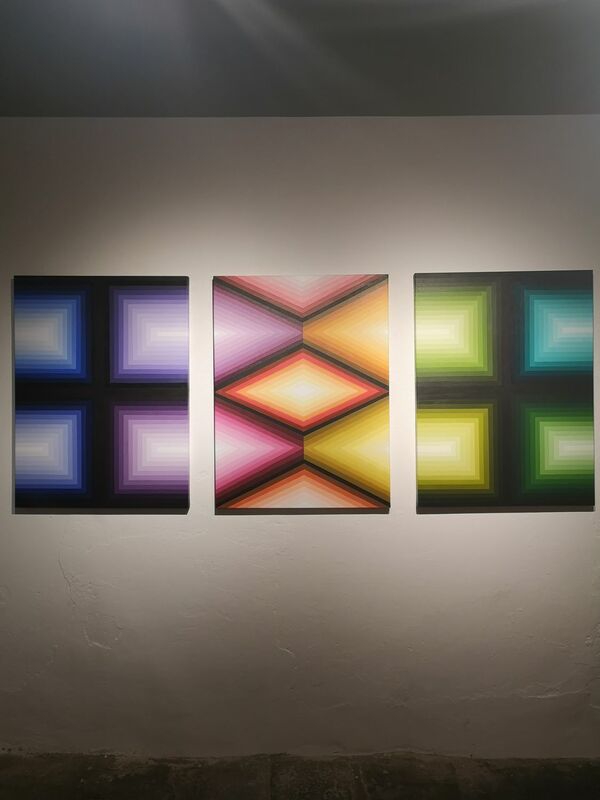 This triptych is one of the most stunning pieces in Complementos. 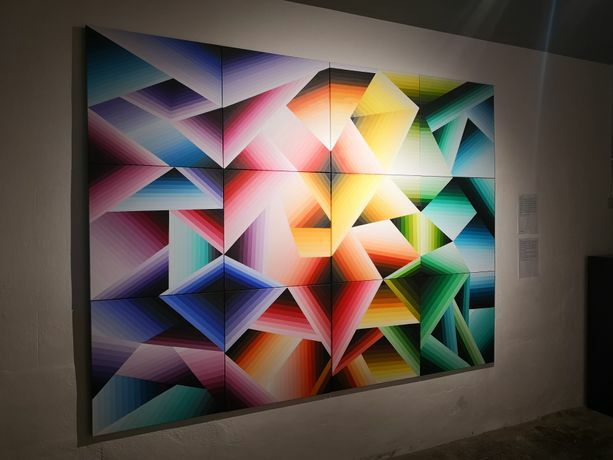 The choice of colours in the piece, and the complex geometry, references those used by Incan's in the past. COMPLEMENTOS is the culmination of a creative process that the artist has been wrapped up in over the last seven months. Prior to this body of work Alessia’s technique was not characterised by studies in the use of light and shadow, rather her work gave priority to the fluorescence of tones and to the perfection of geometric shapes. The collection presented in Bien Cuadrado closes a creative cycle where the artist has focussed on the union of a body of work is assembled by defined lines and a degradation of colours, creating optical illusions. Despite looking as though each piece has been designed they are in fact borne out of an organic process. Each stroke representing a transfer of energy in the moment making intuitive use of light in order to create “Fragmentos de 12 partes” (Fragments of 12 Parts), the centrepiece of this show. COMPLEMENTOS is an exhibition where all the pieces are constantly moving and they can be viewed in many ways, since the whole or individual pieces make up a whole. Moreover, they are a part of the artist, speaking of Alessia’s essence and of the path she has taken to reach this point. In this context, COMPLEMENTOS is a fragments of artists own being. Alessia Innocenti is a Graduate in Fine Arts from the Universidad Finis Terrae (Santiago de Chile). She also holds a Diploma in Art Therapy from the Universidad de Chile. She currently lives in Barcelona and works out of her studio in Bien Cuadrado.